The Italian verb for lodge is the irregular -ARE verb alloggiare. 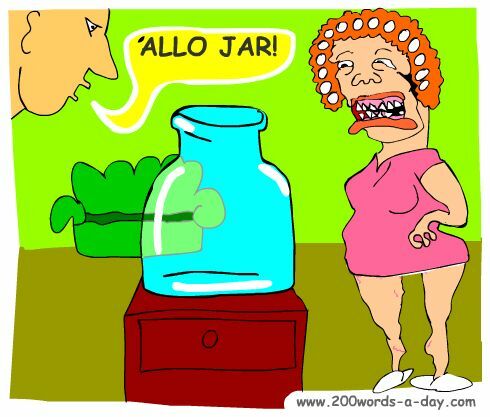 ... imagine A LODGER (person who lodges ) says "'ALLO JAR!" Alloggiare can also mean: to accommodate, to put up, to stay in; to provide accommodation for, to billet. - l'alloggiamento / l'alloggio (nm) : accommodation, lodging(s), living quarters..
- (bene/male) alloggiato (adj/pp) : (well/badly) housed. These verbs remove an i from the stem befpre the endings beginning with i. Verbs conjugated in this way also include : alloggiare, adagiare, arieggiare, arrangiare, contagiare, forgiare, grattugiare, canceggiare, incoraggiare, osteggiare. Learn and remember Italian words quickly and easily with Cartoon Memory Triggers. To remember a word, just think of the pic! non alloggiare (non) alloggi! (non) alloggiamo! (non) alloggiate! (non) alloggino! ✔ Alloggiare is an irregular -ARE verb, these being the most common verbs in Italian. ✔ Learn alloggiare and it will reinforce the pattern for ALL those other -ARE verbs. ✔ You can more easily remember words and verbs like the Italian for lodge - alloggiare using the techniques of the world's Memory Masters. 200 Words a Day! Free Daily Italian Lesson Online - the verb in Italian for lodge is alloggiare - fully conjugated. Italian Learning Made Fun and Fast with your free Daily Italian Verb Lesson - alloggiare.